Listen to our grand daughter sing from the time she was a baby. There are two videos fused together. 🙂 She continues to sing and loves to make up her own songs. What grandparent doesn’t love that! Do you Sing and Make Melody in your Heart to the Lord? Most important is the fact that God tells us we should sing and make melody in our hearts; as Christians we ought to do this on a daily basis. He also tells us to play skillfully with a loud noise. Many places in God’s Word talk about using instruments to bring praise to God. Psalms 33:3 Sing unto him a new song; play skilfully with a loud noise. Does your music portray a New Song? As a child of God you should have a new song in your heart! It should be a song of praise to God for bringing you up out of the miry clay and setting your feet on The Rock to stay. Do you sing and praise God for victories in the daily battles? Singers were found in battle all throughout the Old Testament. And oh what singing and praising there was when God gave victories in the battles. 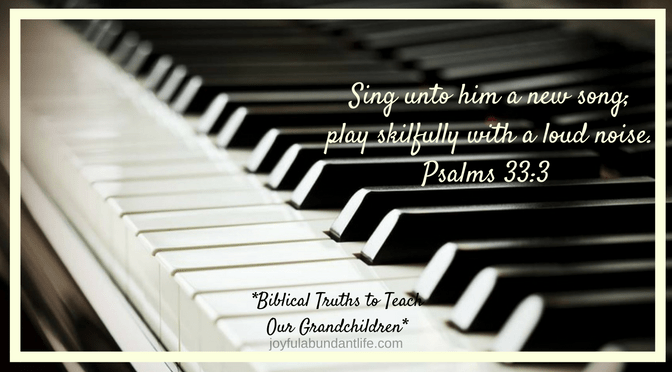 So sing, sing, sing, and bring godly music into your home so your children can hear it and you can continually have a song in your heart to the Lord.